Animated Charts for Excel data charting, animation and trend analysis application. Animated Charts for Excel has a user friendly environment to easily plot 2D and 3D charts with scientific, financial and statistical data from Excel. 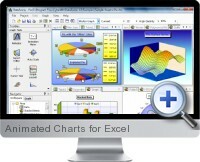 Animated Charts for Excel also allows analyzing and manipulating data with various mathematical methods for charting. Charts can also be animated and exported in high quality for print, presentations, web pages and other outputs. Plotting 39 types of charts with brilliant graph quality. 3D canvas for most chart types. A wide variety of highly customizable graphical elements: transparent color, solid brush, gradient brush, image brush, hatch brush with 56 textures, shadow, visual aspect ratio, and more. Highly customizable and feature-rich chart axes, legend, marks, titles, and walls. Supports 16 built-in graph themes and custom themes. Processing chart data with various methods: Cubic Spline, Moving Average, Integrate, Differentiate, FFT, Curve Fitting, and more. Powerful mathematical parser supporting various built-in mathematical and text functions, including special functions such as Bessel, Beta, Gamma, Error, Hyper geometric, and more. Creating chart animations using time-dependent mathematical formulas and sequences of data. Monitoring, charting and processing real-time data. Exporting to a variety of graphical formats: BMP, JPG, TIFF, PNG, GIF, EMF, PostScript and PDF. Exporting animated charts and charts to AVI and animated GIF for offline and online playback. Clean, friendly, context-sensitive and configurable user interface. A rich set of graphical and data manipulation tools. Automatic chart update and result recalculation upon data source change (real time data source processing).